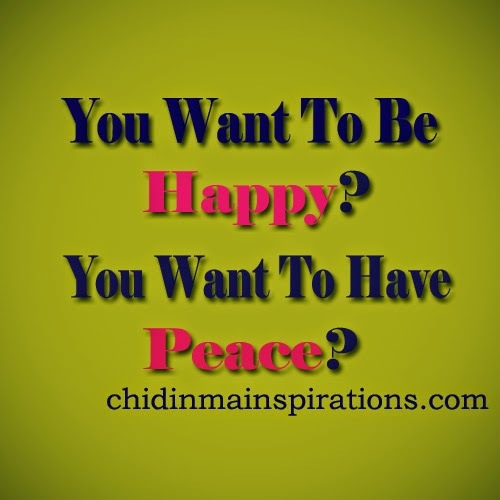 Chidinma Inspirations: You Want To Be Happy? You Want To Have Peace? You Want To Be Happy? You Want To Have Peace? Delete every form of envy from your life and be genuinely happy for others. You want to experience peace, inner joy and fulfilment? Be a source of blessing to others and don't expect a payback. Whatever leaves your pocket/hand for the greater good of others is coming back to you in a million fold. It necessarily doesn't have to be money... an act of kindness etc. Just give & allow God do the paying back. When you are too weak to pray, the prayers of those you made smile in one way or the other will be your strength in your weakness. You are welcome dear. I am glad you were inspired. Its more blessed to give than to receive.i always try to be of help in little ways I can. God bless you for this dear. Smiles. It's been asserted that givers never lack. It's strongly applicable to the above writeup. And I hold on to that heavily. Glad to know you were inspired. Love this line... ".You want to be happy? Delete every form of envy from your life and be genuinely happy for others." You welcome dear. I do appreciate it.